What a wonderful trip! I lost my parents at a relatively young age, so I often think back to the times that I had with my parents. When I think back to my happiest times, it was always experiences. I can't remember any gift that I was given, but I can remember the vacations and fun times that I spent with my family. Because our kids are older now and travel is easier, I want to fill their lives with experiences. For Christmas, the kids big gift will be a trip and this year it was Disney World. We were supposed to go down on Thursday but our friend's, the Wonders, had Ritz points that were going to expire so they transferred them to us and we headed down a day early and stayed at the Ritz in Orlando. It was a beautiful hotel but the kids were so excited about Disney, that we left pretty early the next day to head to the Contemporary. We checked in and headed straight to the Magic Kingdom. The first day was Magic Kingdom day. This is typically the busiest time at Disney, but with my early planning and fast passes, we did not wait more than 20 minutes for any ride. The weather was absolutely beautiful as well! 80 degrees and sunny!! This was by far Jackson's favorite food at Disney. He must have ate at least 1 Mickey pretzel a day. We had a meal plan and per usual, we had a lot of leftover credits. I didn't realize that you could substitute 3 snacks for a meal until the last day. We ended up using all our credits, but next time we will be more strategic! Jackson really wanted a picture of the castle with his Mickey pretzel.. The next day was Animal Kingdom. This was the one "cold" day with a high of only 60. This is the Frozen Gingerbread display at our hotel. Each park has their own themed massive Christmas tree. This one loved it! Here he is running past and pretending to shoot all the dinosaurs. There were very few rides that Beckett couldn't go on and this was one of them. Jackson and I headed to Everest Expedition! 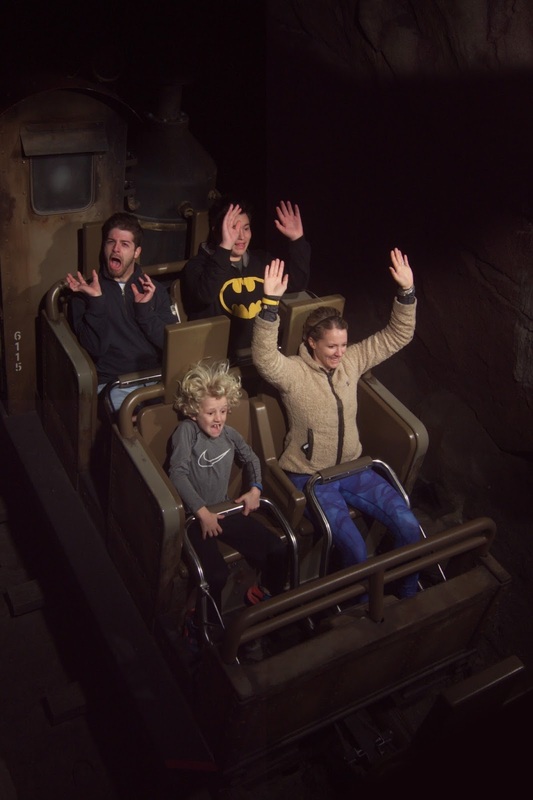 Jackson is not a lover of roller coasters, but he put on a brave face and rode with them me. Doesn't it look like he had a blast in the next picture? Animal Kingdom has a carnival game part called Dino USA. My children LOVE stuffed animals. so we had to play some games. This one was super excited about his winnings. Daddy was super excited to get to carry around a bunch of stuffed animals. The next day was Hollywood Studios. Hollywood studios has the Jedi Experience, but you have to get there as soon as it opens to be able to do it. The other kicker is that the children have to be present, for the sign up. The boys and I ran to sign up while Greg went through the bag line. We got our spots and had an hour to kill before our first fast pass. We were lucky enough to get into the Disney Junior character breakfast. 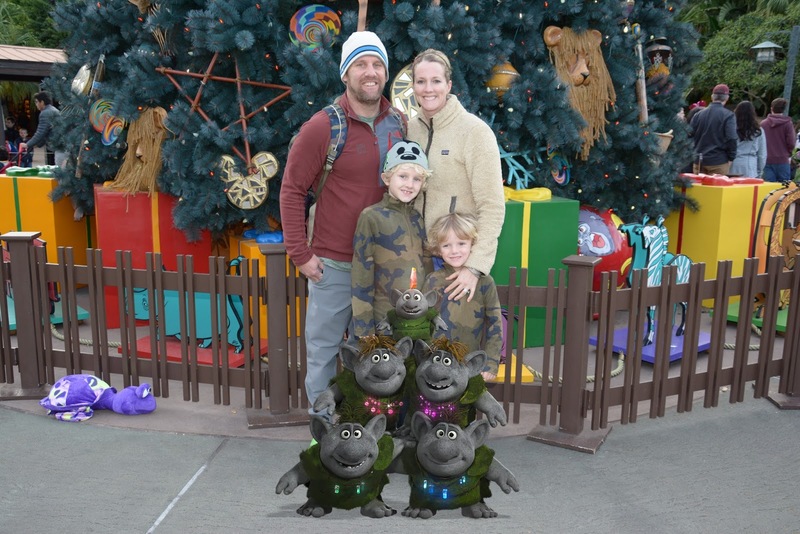 I was surprised to see how much my kids still loved getting their picture with the characters. Princess Sophia. Beckett was shy at first around her, but then he warmed up to her. This really is my favorite park. We are so excited that there will be soon be a Star Wars land at Hollywood Studios. We will definitely be back when it opens up! The first time Jackson did this, he was scared and almost started to cry. This time.....no problem! Using the force to push back Kylo Ren. Our next fast pass was the Rock N Roller Coaster. I was so excited because I loved this ride and this is the first time Jackson could do it. He again was nervous, but it ended up being his favorite ride of the park! We can't wait for Star Wars land! The other big ride at Hollyood studios is Tower of Terror. Jackson rode it last time and opted out this year. Beckett, on the other hand, decided to give it a go. I dont' think he'll do it again. He was fine until about the 3rd drop and then he had enough. After the ride he told me that it "Hurt my heart". We were done with everything at Hollywood Studios, so we headed back to the hotel for beach volleyball and some swimming! The pools were heated and the kids had fun swimming and going down the slide. The next day was Epcot. Our plan was to spend the day at Epcot and then the Ryan's got a hotel in Orlando for the night. We met them at their hotel for dinner, swimming, and a movie over the pool. It was so much fun and great to see them! You can't go to Epcot without getting this photo! The next day we were back to Magic Kingdom! First ride was the Barnstormer. This was wheel of peril was in the line for the ride. The kids were fascinated by the fact that people would stand there while knives were being thrown at them. Don't get any ideas kids! A nice man offered to take a pic of us. This is how Jackson started the ride. The ride Beckett couldn't wait for! He loved driving his own car. Keep your eyes on the road kid! We came back to our hotel pretty early each day since we were getting to the parks as soon as it opened. The last night, we headed back to see it all lit up and to watch the fireworks. We had our last fast pass which was Peter Pan's flight. It always amazes me that this ride is always such a long wait. Without the fast pass, it was over 2 hours!!! Our last day we had a character breakfast at the Grand Contemporary. Here are the kids with Mary Poppins. They had no idea who she was! We are going to have to buy the movie so they can see it! They knew the Mad Hatter though! After breakfast, we headed to what used to be called Downtown Disney and now is Disney Springs. Beckett showing his muscles! We ate lunch at the Rainforest Café, the kids spent their money from Aunt Sarah, and then it was time to catch the bus to the airport. BOOOOOOO!! Somebody was sleepy from all that Disney Magic! The airport had some photo opportunities that my kids just couldn't pass up! What a magical vacation! Jackson wrote us the sweetest letter thanking us for the trip. He said he had the best time from the moment we got off the plane to the moment we left. This is what life is all about! 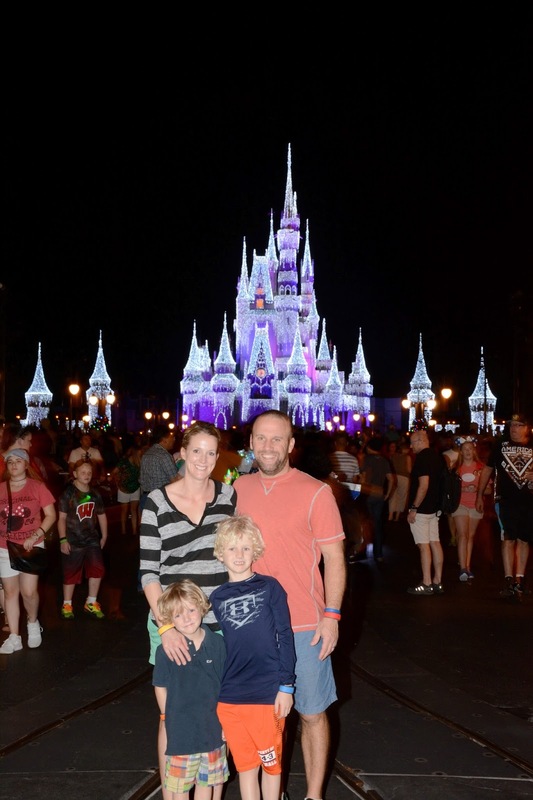 Making magical memories with the ones you love! I can't wait for our next family trip. We are going to Jamaica in February!! Can't wait!! !